It was just what I wanted. Love it. 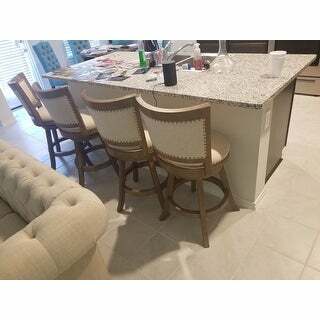 Sit your kids up at the counter to do homework before dinner or serve your friends a delicious beverage with this charming counter stool. 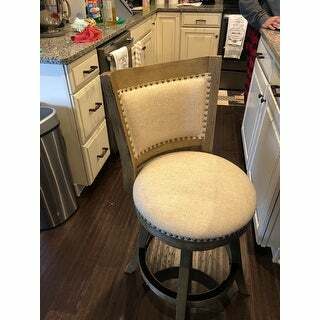 The comfortable padding, pleasing upholstery, and attractive design will make this counter stool a great addition to your kitchen. Dimensions 21.5 In. X 18.0 In. X 37.5 In. I would give this purchase six stars if possible! I am so pleased with this purchase! 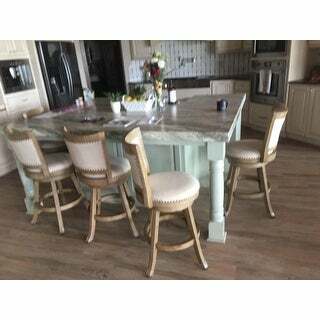 I ordered two of the Melrose Counter Stools for my recently remodeled kitchen. I placed the order on Wednesday evening and they were at my door Friday afternoon! Assembly took about an hour for each one, but it wasn't difficult. The stools are very sturdy and exactly what I was looking for. If you are looking for a true grey color, the Driftwood Grey is probably not for you, but since I wanted more of a taupe it is perfect. Thanks, Overstock! In spite of the very reasonable price, this is a quality piece of furniture. It is made of solid wood and upholstered very nicely with brass nail heads all around each section of fabric. There is a piece of metal around the top of the foot rail to minimize wear to the wood. Nice touch. This will certainly be a lifetime piece. Very comfortable. Looks great at my counter. Pretty, comfortable and sturdy! This counter stool is stylish and also very well built. It feels more sturdy than most counter stools I have tried. Easy to put together. Very sturdy and stylish. Great quality for this price! The Melrose counter stool is a fantastic design, The value is tremendous as stools of this design can easily cost twice as much! 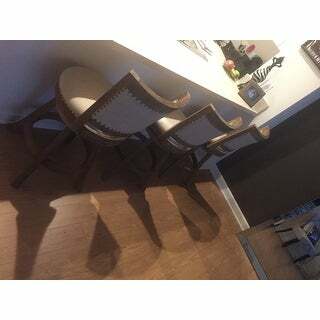 Both the client and I were very happy with the color, the finish and the comfort of the stool. 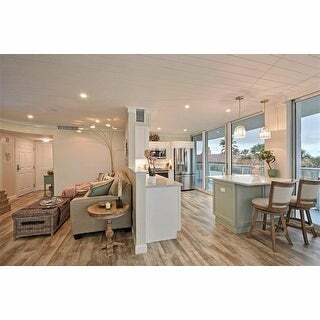 Perfect for the coastal vibe we wanted to achieve. The chairs are very sturdy and heavy. The color is was prettier in person to me. They have a nice seat size and are very comfortable. My only drawback was they are a little tedious to put together and the foot rest should have been covered. I have noticed it with wear, the foot rest has started to splinter. Overall, would have given them a 5 star, but with the exception of the foot rest I am very pleased. The color of the wood was a little more yellow than it shows in the picture. There is also a ton of pieces to put it together. These stools are very comfortable and good looking. 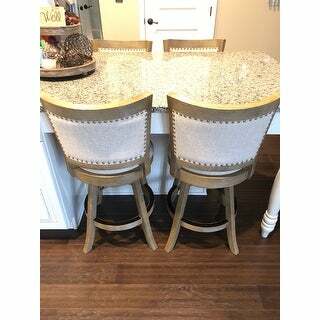 The only reason I gave them a 4 is because the attractive nailhead trim goes completely around the seat and the front trim easily scratches our kitchen island. We found some tape to cover the front nailheads so that we don't have further damage. In addition, we found that the bolts come loose over time and they should provide lock washers to secure those. They are beautiful in person a picture doesn’t do them justice. It took my husband 45 mins per chair. The legs do seem to damage very easily very soft wood FYI. I have 4 small children and they are holding up to them. 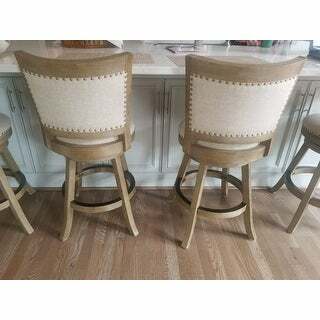 I had bought 4 other bar stools from OS and I sprayed them with Scoth guard and they didn’t hold up at all had to replace them 2 months later with these and I also sprayed these with scotch gard. 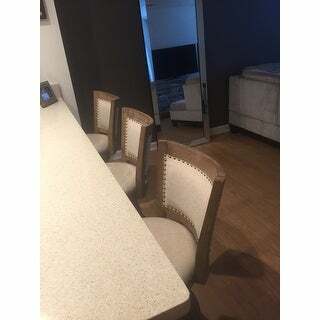 I have had these chairs for about 3 weeks and as you can see in the pics they still look great. They are more beige then gray but still love them! I bought three. They work great as stools for my counter. Similar to the picture. Take about 30-45min to put them together by yourself. Very good quality and they are durable and a lil heavy to lift. Ordered the grey and ivory and the chairs are so far from grey and ivory it is not funny. Brownish wood and tan fabric is what it really is. They tell me the colors vary but have not had this kind of color issue with any other overstock product. Wish I could attach a picture of the actual color. They need to fix this because the chair look nice! These stools are definitely tan, not gray as advertised. I was prepared for the color discrepancy from reading reviews, but what disappointed me the most was the durability. I specifically bought these stools because there rated as being so sturdy. While the stools are sturdy, they are not “kids sit on me everyday” sturdy, and I’ve had to replace several screws and bolts after only a year. 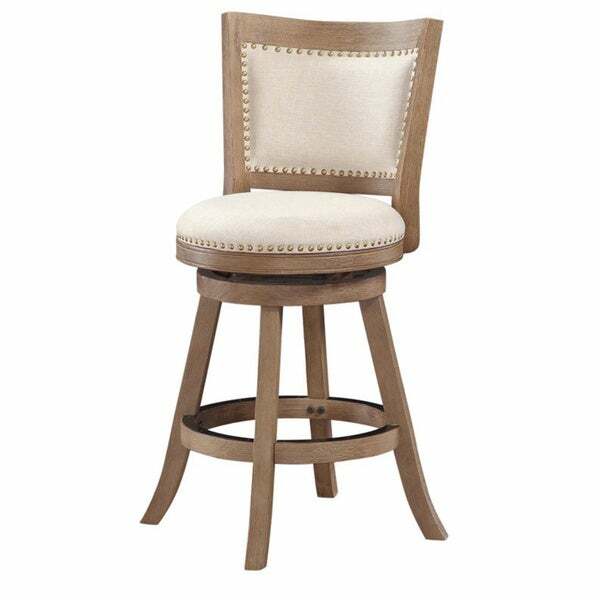 Great swivel bar stool! Sturdy and durable - color is more a beige toned chair but still works! 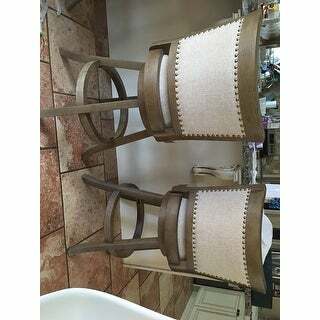 These chairs are so beautiful and goes so well with my kitchen and dining room. They were easy to assemble and very durable. My parents purchased two chairs as a Christmas gift and I bought another cause I loved them. The chair is easy to assemble by one person. Quality seems good. The "wood" is something other than wood (resin??) but they look really nice. Putting this in a high end town home, and it fits in beautifully. Pictures are very accurate for finish and seat color. I already had 2 of these...but loved them So Well that I ordered another one. Very well made and absolutely Love the style. Easy to assemble. Bought three of these chairs for my counter. Great height and superbly comfortable. Looks super high end and have received loads of compliments. Only con, took a bit of time to build these. 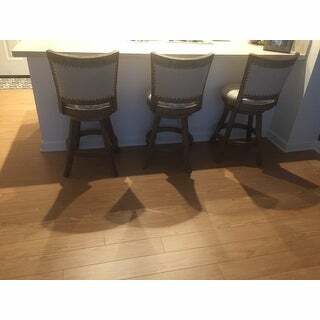 Love these counter stools. Took some time and a friend to assemble . 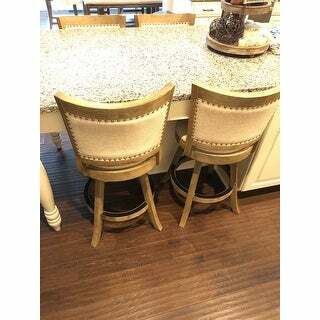 These stools are gorgeous and literally match my linen tufted couch to the T! They are heavy duty and comfortable and I think could easily hold a 300 lb person. "Are theses bar stools made do solid wood?" they are rubberwood which withstands anything! beautiful wood and quality! "are you getting these stools back in 24 in in grey?????" "Will you be getting these back in stock in the grey color?" Is there a table to match this chair? "Does the material on these chairs stain even with scotch gaurd? I have little guys and spills WILL happen"
They are top quality and withstand anything! I put my own scotchgaurd on them even if they did. "When are you getting the grey back in stock?" "Does this product contain flame retardant or any other hazardous material?"